A dance performance for children age 5-9 years. "In the darkness, the space the night, something blue is shining from water, Like a blue green ball, with a sun from a distance"
In an artistic interpretation of Lotta Olsson and Olof Landström's poetic children's book the dancers embody parts of nature and play with both natural and un-natural materials. 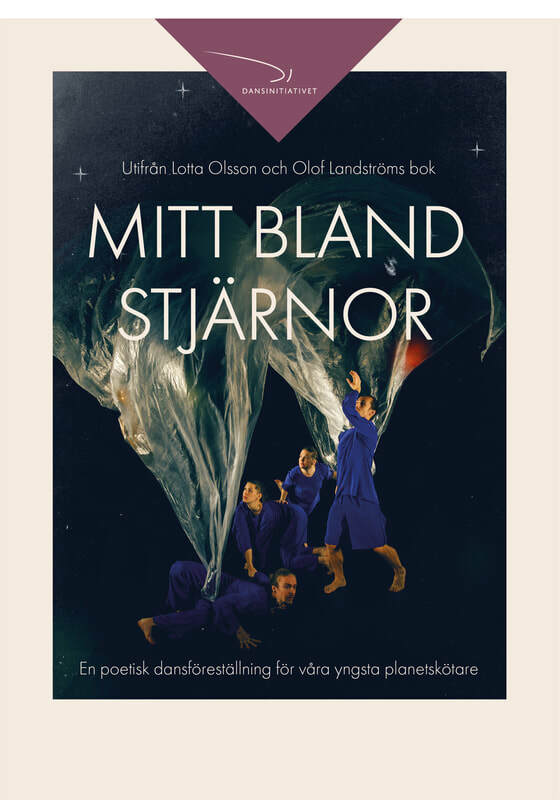 ​Mitt bland stjärnor unfolds in a room full of motion and aims to awaken questions about climate change and the different forms of life on earth - for our youngest planet-keepers. Dansinitiativet in co-production with Norrlandsoperan. Dancers: Alexander Dam, Maria Ulriksson, Moa Autio och Jacob Börlin. Here you can read about the accessibility at Norrbottensteatern. Would you like to buy the performance to your city? The production was created in residency via Dans i Västerbotten 2019. Supported by Luleå kommun, Konstnärsnämnden, Kulturrådet, Region Norrbotten, Region Västerbotten. The book is published by Lilla Piratförlaget.